“We have to investigate why we lose our health. Excessive thinking, worrying and studying is the main cause for man’s illness. Some students are absorbed in studies all the time, because of which they lose their health. There is a limit to everything, the Greek philosopher, Aristotle, conducted extensive research on the digestive system of man and as a result of too much of thinking, his health deteriorated and ultimately he died of digestive problems.” Sathya Sai Baba. Sanathana Sarathi‘ Jan. 1999, p. 15. SO DID ARISTOTLE ACTUALLY DIE FROM ‘TOO MUCH THINKING’? Forgive that this is not exactly ‘breaking news’, but intriguing it is! 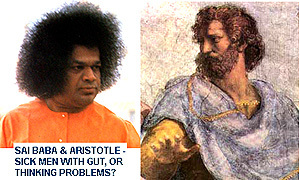 Sai Baba admits that Aristotle studied the digestive system of man and then – in the usual garbled way – failed to make everything entirely clear. Let’s first assume Sai Baba was saying that Aristotle concluded that too much thinking leads to digestive problems and death (“ultimately”)? Then surely mankind today, with our vastly enhanced mental activities, mental professions, mental interests (the media, internet etc.) , must be suffering from digestive problems on an equally massive scale? But where is the evidence for that? In short, there is none. If there were, would it not be a massive medical breakthrough to revolutionise much medicine? It is more likely that Sai Baba confuses figurative ‘mental indigestion’ with the actual physical sort. Sai Baba stated in so many words that Aristotle himself died of thinking too much, causing digestive problems caused by thinking too much (such as about human problems of thought and digestion)? There is no historical evidence for that protracted surmise, though (as Kasturi probably knew and told him) Aristotle reportedly did die of a ‘stomach ailment’, though not specifically indigestion. It was recorded that it was a ‘disease’ affecting his digestion, but could have been cancer or any number of other infectious ailments. If indeed too much thought was what really caused his death, how did Sai Baba arrive at that conclusion… by paranormal and divine powers, no doubt! Of course Aristotle “ultimately died”, uncontroversial… but was it that overripe peach, that indigestible Kalamata olive that caused his death… or was it from thinking? Or perhaps rather a result of Divine Will, Lord Yama’s inevitable decision (to which deity Sathya Sai also attributed the decision on every human death)? “There is a limit to everything” says Sai Baba… now, really? I read in Sai Baba Discourses many times that the Atma is limitless, that God is eternal and unencompassable. But it is reassuring too, for a limit to Sai Baba and his influence is also therefore promised. His death must be a bit of a limitation on his activities? No?? This entry was posted on August 9, 2007 at 6:07 pm	and is filed under Famous people, Gurus, healing, Health and Medicine, Heavy News Insider, India, Mind control, Para-psychology, Rationalism, Uncategorized. You can follow any responses to this entry through the RSS 2.0 feed. You can leave a response, or trackback from your own site.